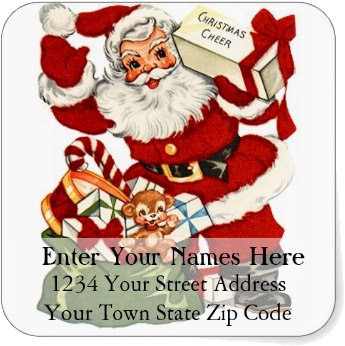 Vintage Santa Claus is delivering toys and the Christmas tree on this Christmas return address label. A red bow ties together a bouquet of white Christmas flowers. Sweet Christmas address label. Modern Christmas return address label with a red foil wrapped package and a scattering of Christmas stars. Christmas snowman dances with his candy cane on this vintage Christmas address label. 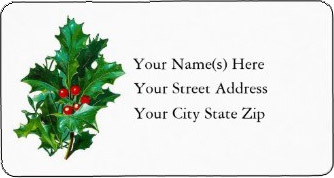 The traditional Christmas plant with its red and green leaves makes an attractive Christmas return address label. 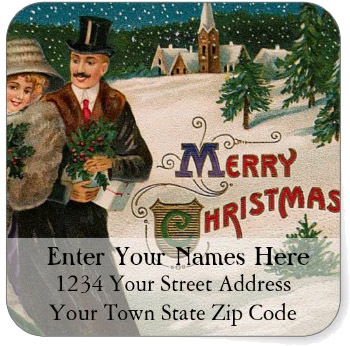 Easily upload your family Christmas photo or any photo for a custom Christmas address label. This Christmas return address label serves as a reminder for the reason for the season. This Christmas return address label has a vintage image of a Christmas puppy surrounded by flowers and the text A Merry Christmas below. 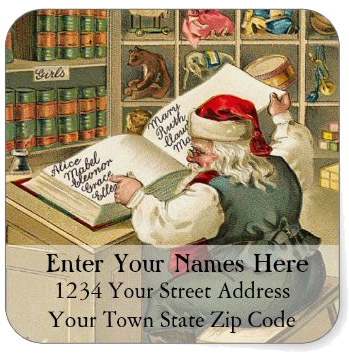 Colorful vintage lion nutcracker on a black background makes a stylish Christmas address label. Your information in white text. Colorful Christmas address label with a potted Christmas tree and Christmas presents under the tree. Vintage Christmas address label with ringing gold bells covered in green and red Christmas holly. 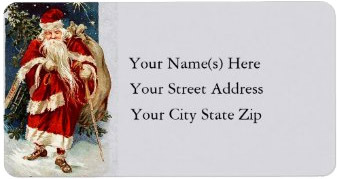 Fun illustration of one of Santa's reindeer makes a simple and compelling Christmas address label. 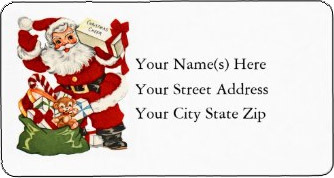 Retro Christmas return address label with a smiling 1950s cartoon family peeking out from behind their front door. 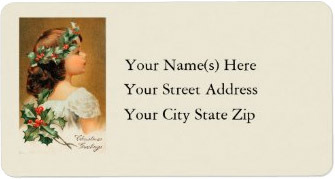 A vintage Christmas address label with a cute young girl wearing a red dress with holly in her hair. 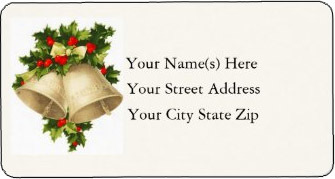 Photograph of a Christmas wreath candle ring fills the left side of this Christmas address label. 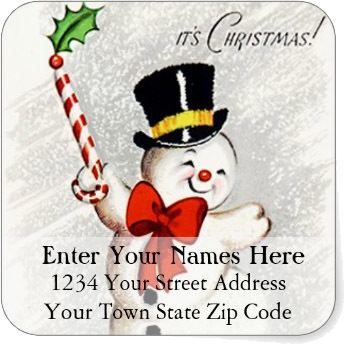 Cute and fun Christmas return address label with three happy snowmen playing Christmas music. 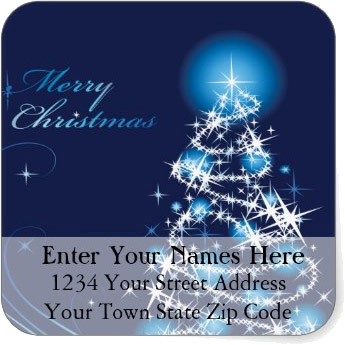 Swirly modern blue Christmas tree on this blue background Christmas address label. Your text in white. Two red mittens hang from the wall filled with Christmas candy. 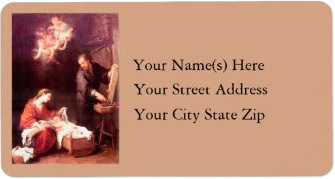 A colorful Christmas return address label. 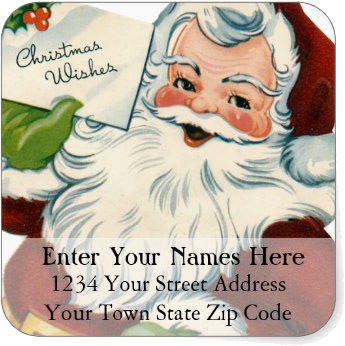 A vintage portrait of a rosy cheeked Santa Claus fills the left side of this Christmas address label. 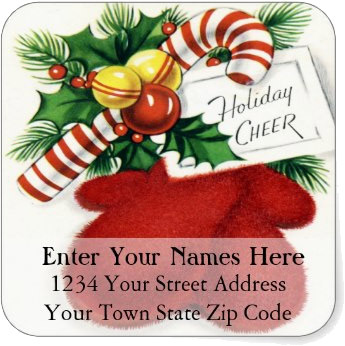 This Christmas address label has Christmas poinsettias filling the left. Colorful and Christmasy. This vintage Santa is delivering a christmas card with Christmas wishes. Cute Christmas address label. 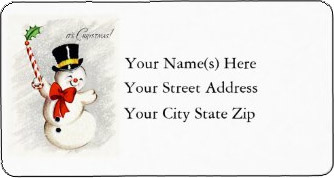 Mr and Mrs Snowman and their Scottish terrier offer a friendly Hi There on this Christmas return address label. This smiling vintage snowman is set against a black Christmas return address label. Your text in white. Stylish. 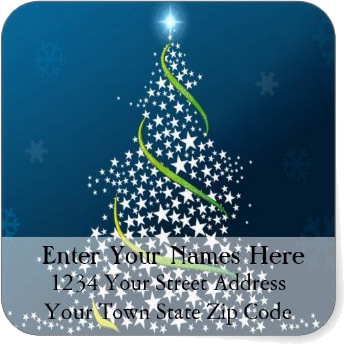 Modern gold and swirly Christmas tree topped with a star on a red Christmas return address label. A vintage fine art painting of angels playing music and serenading Mary and Jesus. Captivating Christmas return address label. 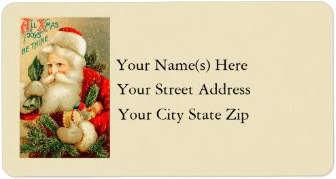 This Christmas return address label has a vintage Santa Claus delivering a case of Christmas cheer plus toys. Christmas snowman dances with his candy cane proclaiming "It's Christmas" on this vintage Christmas address label. 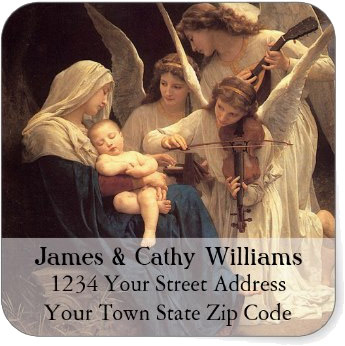 This Christmas address label features a nativity scene with the Holy Family in the stable. 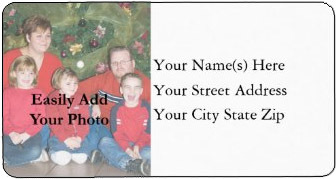 Create a fun personalized Christmas address label with your family photo and address. 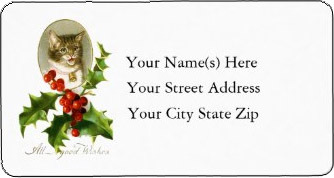 Cat lovers Christmas return address label. Cute vintage portrait of a kitten with red and green holly. The text "All Good Wishes" below. Snowy fields and a distant village are the background for ringing Christmas bells. 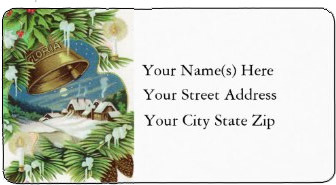 A peaceful country scene on this Christmas return address label. This Santa is walking down a snowy country lane with his bag of toys. 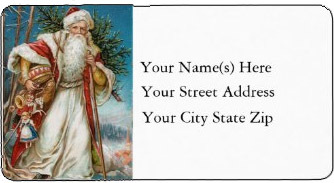 A popular Christmas address label. This vintage Santa Claus is hurrying to deliver toys and trees. 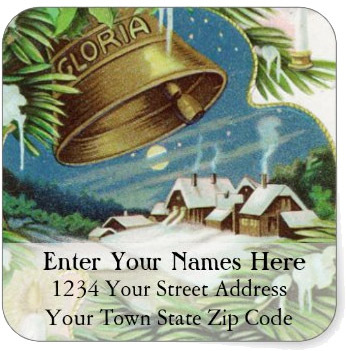 The upper right of this Christmas address label includes the text "All Christmas Joys Be Thine". 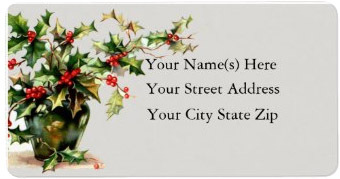 This Christmas return address label frames your information with red and green holly in a vase. 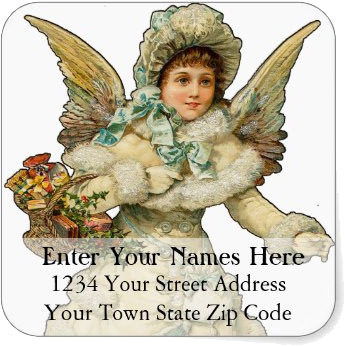 This pretty young girl with a holly headdress makes a sweet Christmas return address label. 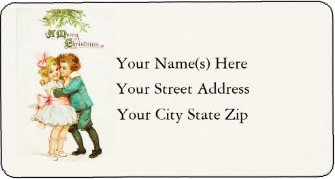 A sweet vintage Christmas return address label with two young children embraced under the mistletoe. The text "A Merry Christmas" in vintage font. 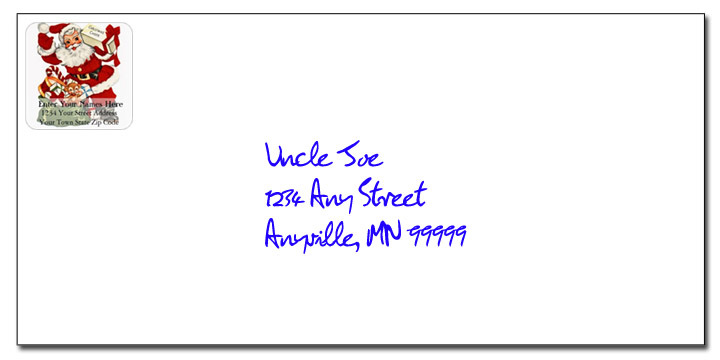 A simple yet colorful Christmas address label. A vintage red and green illustration of Christmas holly and berries to the left of your address. A pair of red mittens filled with toys and candy hang from the wall on this vintage Christmas address label. Gift card says Holiday Cheer. A captivating modern take on the Christmas tree. Swirling whites and blues your text in snow white. 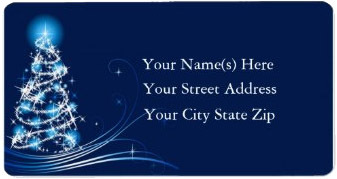 Beautifully blue Christmas address label. This colorful vintage Christmas address label shows Santa Claus with his arms full of toys and a Christmas tree. Two Christmas bells covered with red and green holly ring out on this vintage christmas address label. Framed vintage illustration of Christmas elves and the text A Right Merry Christmas. 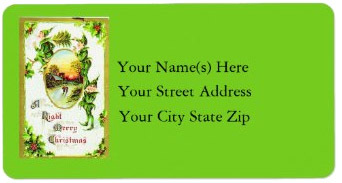 Christmas green background on this Christmas return address label. 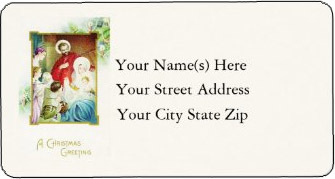 Children visit baby Jesus in a vintage painting on this Christmas address label. The text "A Christmas Greeting" below. 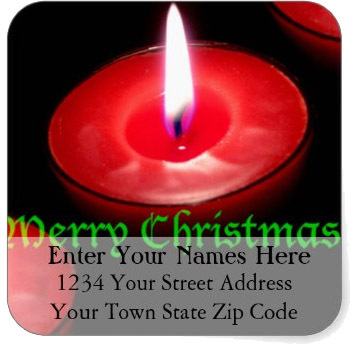 A burning red Christmas candle fills the frame of this Christmas return address label. Merry Christmas in a green font. The text Merry Christmas in a vintage red font with floral embellishments. The perfect greeting for a Christmas address label. 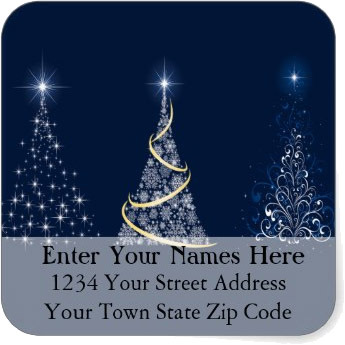 Swirly modern blue Christmas tree on this blue Christmas address label. Your text in a screened banner with Merry Christmas in the upper right. 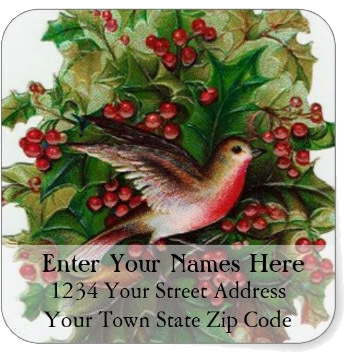 Vintage color illustration of a red breasted Christmas bird on a holly branch fills this decorative Christmas address label. Photograph capturing a ruby-crowned kinglet on a Christmas tree branch. 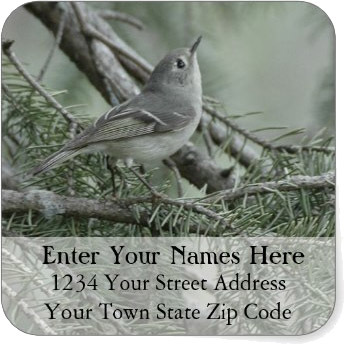 Christmas address label for bird lovers. White stars and green ribbons swirl to form a Christmas tree. Blue background on this Christmas return address label. A classic looking Santa is making toys late into the evening. 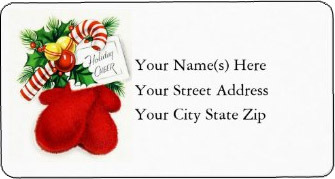 A colorful Christmas address label. 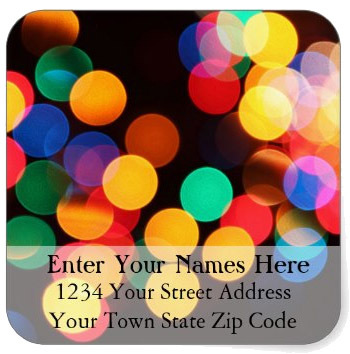 A colorful array of out-of-focus Christmas lights fills the frame of this modern Christmas address label. Angels play for Mary and Jesus in the stable on the first Christmas. 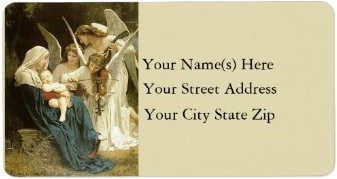 A touching Christian Christmas Address label. 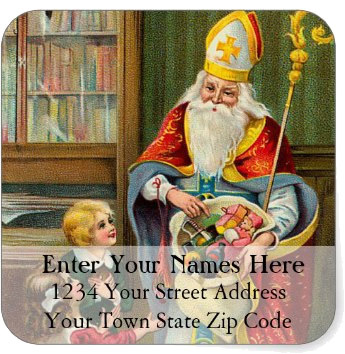 Colorful vintage illustration of St Nicholas delivering gifts to children fills the frame of this Christmas return address label. Santa sits at his work bench reviewing the naughty and nice list. 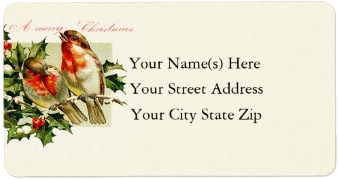 Fun, whimsical vintage Christmas return address label. A happy eighteenth century couple head home after Christmas Eve services. The text Merry Christmas prominently on the right. 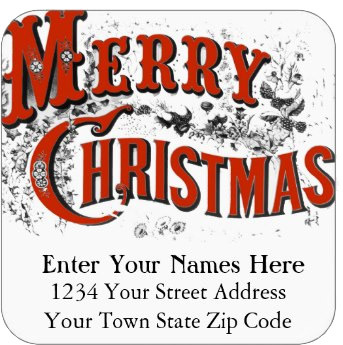 Three star filled and swirly Christmas trees make up this Christmas return address label. 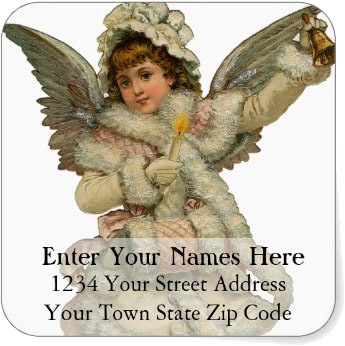 A warmly dressed Christmas angel fills the frame of this Christmas address label. This vintage Christmas address label has Santa ringing Christmas bells next to a Christmas tree. The text Merry Christmas at the upper right. 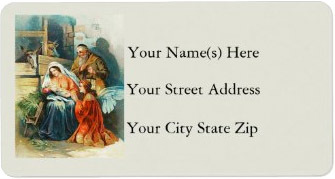 This decorative Christmas address label has a vintage Santa Claus delivering a box of Christmas cheer and toys. 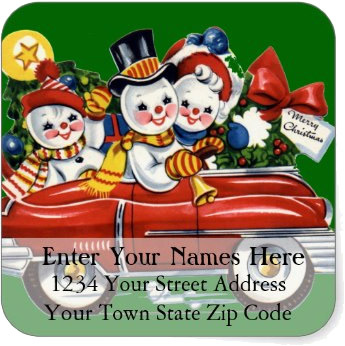 A very retro Christmas return address label with happy snow people delivering a Merry Christmas wreath by car. 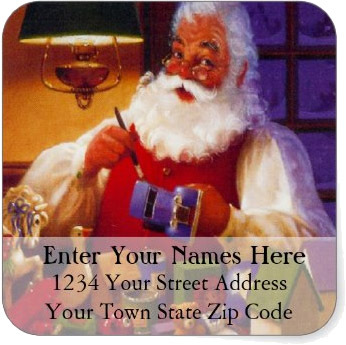 A smiling vintage Santa fills the frame of this square Christmas return address label delivering a card of Christmas Wishes. 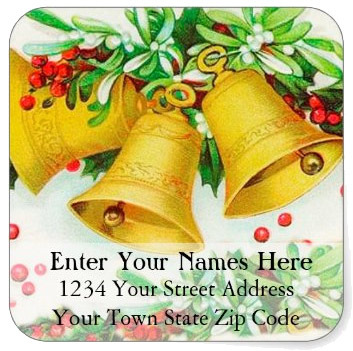 Three Christmas bells set among holly branches ring in Christmas Day on this colorful Christmas address label. This happy dancing vintage snowman is a cute Christmas address label. With his candy cane in the air he proclaims "It's Christmas!" Two cute kittens sit underneath a ringing Christmas bell. 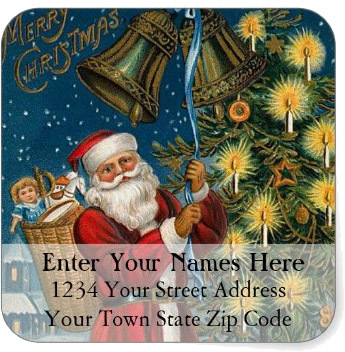 The text "It's Christmas" in the upper right of this Christmas return address label. Two red mittens are tied together with a candy cane, holly and ornaments. The gift tag reads "Holiday Cheer". 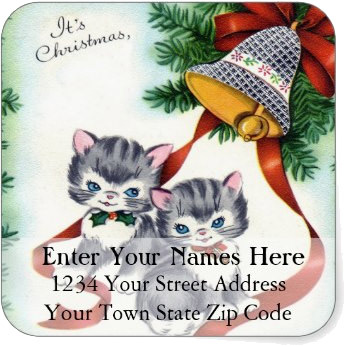 A fun vintage Christmas address label. This vintage angle is warmly dressed as she rings in Christmas with a bell in one hand and a candle in the other. A lovely Christmas return address label.